Mike Andrews says Scent-Lok is going viral … in a good way. The company isn’t resting on the laurels of its highly regarded activated carbon scent control garment systems. It has come out strong in 2011 with Level One antimicrobial garments and the new, Native Species traditional (though non-odor-suppressing) outdoor camo line. Moving outside their customary niche is a big order, but Scent-Lok has been in business selling odor-eliminating camouflage for nearly 20 years—a long time by some standards—so the company obviously knows what its doing. Scent-Lok’s Native Species garments are printed exclusively in Vertigo, a camouflage pattern that its parent company, ALS, developed in 2009. Vertigo comes in tan or gray background. 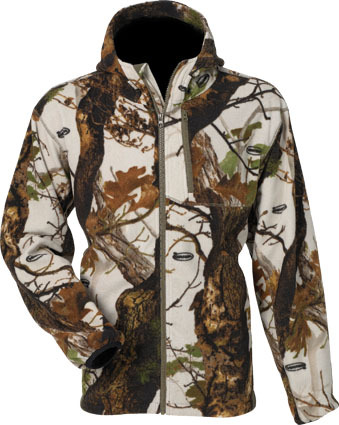 In tan the camo serves hunters on the ground and later in the season when green foliage begins to turn. In gray, Vertigo is ideal for elevated treestand hunting or for late season hunting when trees are bare or snow is on the ground. 5. Accessories (in Vertigo tan and gray): six-panel hunting cap; pop-top gloves (the benefits of a glove and a mitten); snug-fitting, fleece Wild Wolf beanie; Radar hat with a fold down ear cover. But Scent-Lok’s specialty is clothing that will reduce human odor. Why develop a traditional line of clothing to enter an already crowded field? “Scent-Lok activated carbon technology—combined with a good shower and scrub with non-scented soap plus a layer of our Level One microbial—is still the very best way a hunter can reduce his scent signature,” Andrews says. Learn more about Scent-Lok and its garment lines by visiting its web sites at www.scentlok.com, www.vertigocamo.com or on YouTube.com. Minimum advertised prices (MAP) are listed in the Scent-Lok catalog. Follow Scent-Lok on Facebook.com or call (800) 315-5799. To get started, sign up at www.3Point5.com. Click the “Sign Up” button and follow the prompts. If you have questions, contact Mike Wiseman at (800) 315-5799.